One of the best things about blogging is the people you meet who become lifelong friends; and when those friends are talented bakers, they write beautiful cookbooks and send a copy to you. Such is the case with Marbled, Swirled, and Layered written by our very good friend Irvin Lin of the wildly popular blog, Eat the Love. Irvin is a passionate baker with a love of all things pastry and who also happens to have a gift for pairing traditional flavors with unusual combinations; they create multilayered desserts you might not have considered: Seville Orange Bars with Salted Shortbread and Gin Meringue (Gin Meringue!) or regional recipes such as Butterscotch Whoopie Pies with Apple-Cream Cheese Filling. His cover recipe, Marshmallow-Filled Chocolate Cake is a spin on one of my childhood favorites – the Hostess Cupcake – complete with swirled icing on top. I’ve been a gluten-free baker for the past 6-years and even though this isn’t a gluten-free book, the recipes can be converted with success so there’s no need to feel left out at any type of celebration. There are also recipe hacks which give a traditional recipe that special ‘sumpin’-sumpin’, such as adding bourbon or spiced rum to a pie crust (Apple-Blackberry Tarte Tatin anyone?). 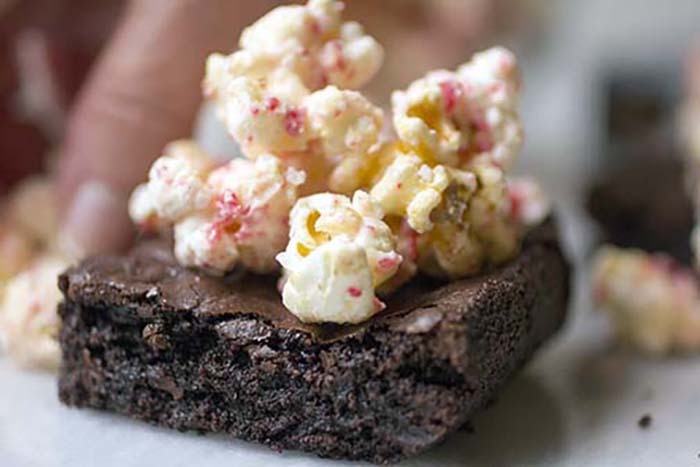 I have several pages flagged for recipes to bake in 2017 but one of my seasonal favorites is Irvin’s take on the humble brownie; I’m pretty sure we can all agree on our love of brownies but topped with Salted Caramel popcorn? Sublime. But wait . 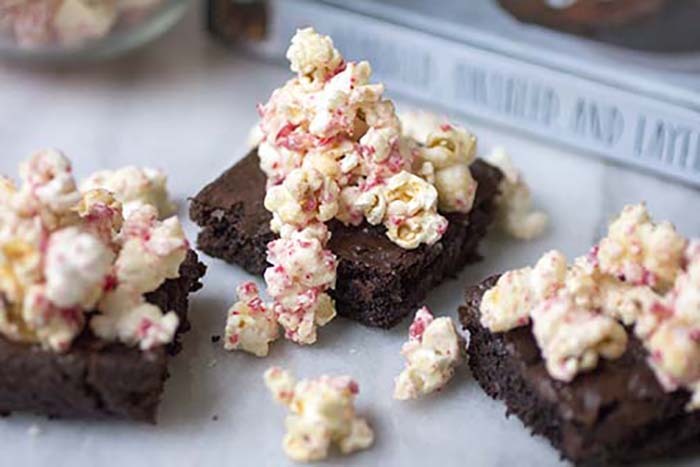 . . he also gives a few alternatives including one for Candied Peppermint Popcorn Mocha Brownies; so good in fact, that the recipe landed in Oprah’s December issue . . . yes, the Oprah. I made mine gluten-free and switched it up yet again: white chocolate ganache popcorn, laced with crushed peppermint candy. We shared leftovers (who has leftover brownies??!!!) with The Professor’s students and they were a huge hit! 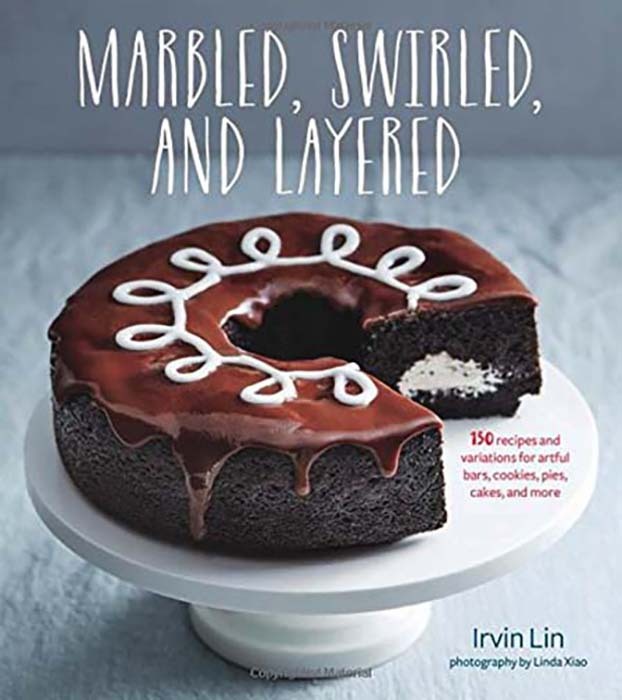 If you’re a baker, even a gluten-free baker, you need Marbled, Swirled, and Layered on your shelves – it’s a beautiful book – and one you’ll bake from again and again. Disclaimer: I am not being compensated to share this with our readers; and while I received a free copy of the book, everything I write here are my own words, my own opinion, and my own experiences. 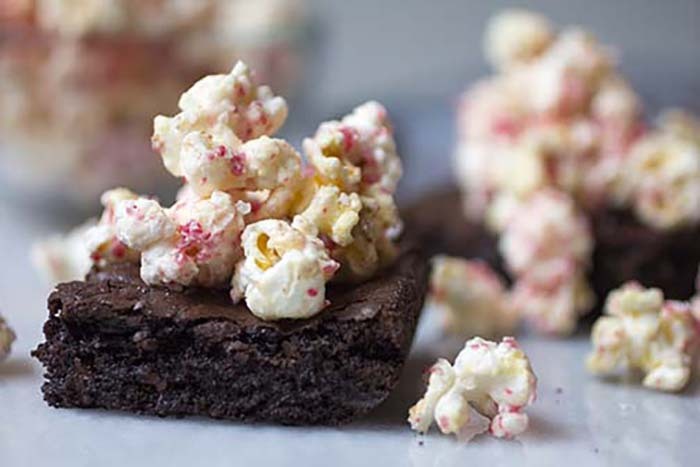 Allow popcorn to set (about 5-minutes), cut brownies into squares, top with popcorn and serve!